I've had a look at several photographs of that giant Philippine saltwater crocodile, not to mention a few videos, and I must admit that's probably the largest crocodile I've seen. There's a good chance that this one isn't an exaggeration, although I'd still like to see the measurement and weight independently verified to be certain. I'm so used to reading stories with exaggerated crocodile lengths, that when a genuine enormous crocodile does surface it can be difficult to accept at face value. But from what I've seen, I'd be prepared to believe this one. It's certainly at least 18 feet long, bigger than Cassius, and hopefully it really is 21 feet (6.4 metres). There has been some doubt raised about the weight, but there's so little information on the weights of large crocodiles out that that size extrapolations from existing datasets are likely to be inaccurate for very large crocs. I have a feeling we'll be getting some independent verification soon. I'll keep you posted, but it's pretty exciting to see such a huge crocodile regardless of the actual figure attached to it. I agree, this is an extraordinary find, a true living dinosaur! Looking closely at the various pictures of the animal, 20 ft. seems very reasonable! Judging by the girth it is likewise, well fed. 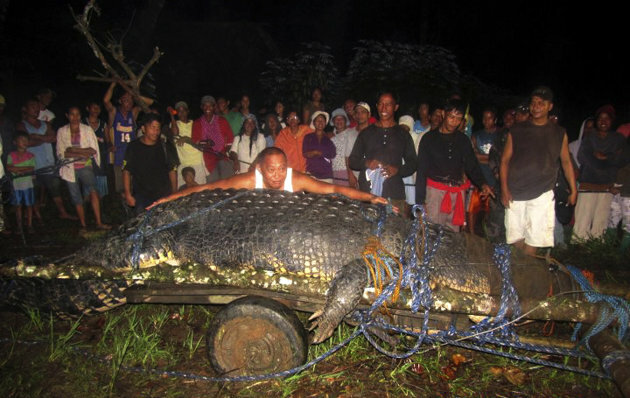 Crocs in the Philippines are endangered, making it even more impressive that a monster like this escaped the slaughter enabling it to grow this big. I can't wait for more verifiable info. Its a great day for crocs because every media outlet in the world has something to say about it, and many are saying things like "This photograph is a document of the marvellous, a token of respect for nature – not a nature sentimentalised, but fearsome and fantastic." -- Jonathon Jones of "The Guardian." Reading the story, it reminds me of that old story from the Philipines of the Jala Jala crocodile from the 1800s, whose skull is at Harvard's museum now, both stories talk about "100 people" hauling the crocs out of the water. If he is really 20+ feet, I hope someone gets a chance to take some measurements of his head and relate that to the skull-to-body ratio. Nice to read you're opinion on this, Dr Britton. It says a lot if someone like yourself thinks it's the biggest crocodile you've seen. It makes me feel more confident myself, but I definitely understand why you want to wait for indepenent verification. What can be illusive however, is that Philipinnos are pretty small on average which may make the crocodile seem lager than it is. But even then I find it hard to imagine that this crocodile would be any less than 5.8 metres. You can find a perfect picture of "Bujang Senang", an alleged 19.3 feet crocodile shot death in Malaysia, and Lolong seems to be larger. I think the crocodile in your link may be a misrepresentation of "Bujang Senang"
George Craig measured the skull of Bujang Senang in Kuching a few years back. By the way Cassius's is around 68cm with maybe a bit missing. It's the same crocodile. They have the same wound on the upper back. On the picture I linked, you see the complete crocodile with people behind it which gives a perfect representation of its size. Now I'm not sure if the 19 feet 3 inches was his verified size, but I'm positive Lolong is bigger. I'm highly skeptical of its skull size. 77 cm would make it the largest saltwater crocodile skull ever and it would debunk the 1:7 ratio. According to his research the largest saltwater crocodile skull is 76 cm and is found in a Paris museum. Yes we Filipinos are small. But if the mayor, who has his entire arm reach over the back of the croc, is 5 feet tall (even small for us Filipinos) Then that would make the croc still within the bounds of 20 feet long.So yes...still hard to imagine this croc being smaller than 20 feet. And that's me talking, a guy who is equally as skeptical as Dr. Adam himself. I agree, it's highly likely the croc is within the bounds of 20 feet. NG and Guinness had plannend to sent a team to the croc to verify its lenght. But they seem to have postponed it. It probably has something to do with not wanting to change their 2012 edition of their book which had just listed Cassius as the world's largest. I can't say too much right now, but I'll hopefully be in the Philippines in a little over a week to measure Lolong. May I ask how you are planning to do it? Are you going to recapture the croc or just judging its size with a device? If I'm going to do it, it has to be done properly and accurately. More on this later.